Today, I present an absolute winner of a recipe, Chettinad tomato chutney. 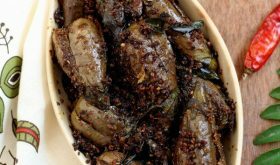 Chutney aka Pachadi is a revered dish in our home and my blog is testimony to it. Chutney recipes are numerous with various permutations and combinations. I do not follow any particular chutney recipe as such when I venture out to make a pachadi. I just add a twist to an original chutney recipe by tweaking it and a new chutney flavor is born. I wanted to make an authentic Chettinad tomato chutney to go with idli for breakfast and went about searching through my large collection of hand written recipes for one. 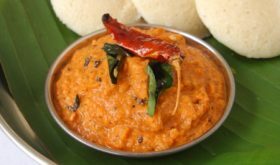 I found a couple of chettinad chutney recipes but was not sure how authentic they were but settled for this particular chutney recipe as I liked the list of ingredients that went into its making. I’m glad I made it. 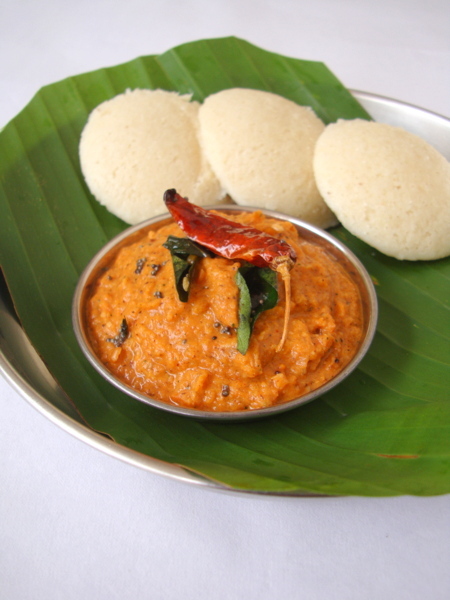 Its the coconut milk which elevates the flavor of the tomato chutney. 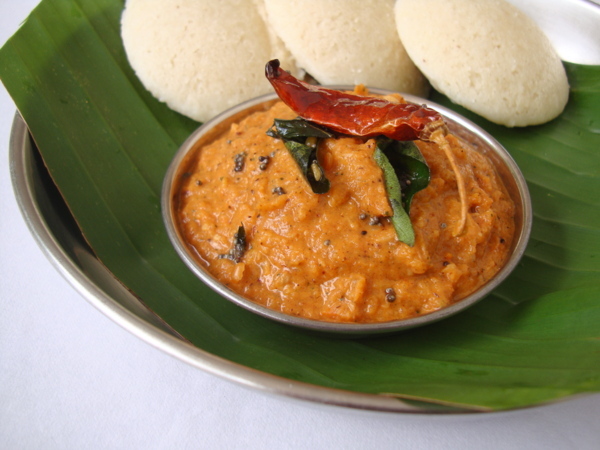 Spicy with slight tang and sweet notes, Chettinad tomato chutney is sensational and a keeper. Heat oil in a vessel. Once the oil is hot, reduce flame, add chana dal, red chilies and green chili and saute till the dal turns light brown. Remove the dal, green chili and red chilies from oil and keep aside to cool. In the same oil, add the onions and ginger and saute till transparent, approx 3-4 mts. Add the tomatoes and saute for 9-10 mts on low to medium flame. Turn off heat and cool. Blend the cooled ingredients (dals, chilies, tomatoes and onions) along with salt and coconut milk to a fine paste. Remove onto a serving bowl. By Sailu Published: May 25, 2012 Made Chettinad Tomato Chutney with idli for our breakfast today. I try to prepare a new variety of chutney recipe for idli and dosa. I’m Punitha , do you remember me ??? Neat presentation as Usual, looks and sounds well…. One humble request to you Sailu. I know you are always having hectic schedule. give me your opinion and suggestions abt the blog Sailu. Thank you Sailu and convey my warm regards to Nehal…. Can have this chutney every day, yummy and flavourful..
wow………tempting recipe…i should try it out soon. Thanks Sailu !!! One suggestion to the recipe. Coconut milk is not an easily available ingredient unless you open an entire can of it. Instead I used dry coconut shredded 1tsp. Also one needs to increase flame to let the water evaporate in the sautÃ© stage of the chutney will be of runny consistency. Tried the chutney recipe this morning. My family and I loved it! Thanks a lot Sailu. I didn’t have coconut milk and neither did I have the time to extract fresh milk. So I substituted with fresh coconut. The next time I will try with the coconut milk. wow i tried making the chutney and i must tell u it came out yummiest….i became an instant star in my family….everyone loved it with idli and dosal….i only tweaked the recipe a little instead of coconut milk i added little pieces of coconut while grinding the paste….it tasted yummy….muah thanks for sharing the recipe…. I just tried this & it came out awesome. Thank you!! Tried this chutney today- it came out delicious! Hey Did you prepare it on regular basis? if so does coconut help!! Im a 10 week pregnant and nauseous.Today i tried this chutney came out well without coconut milk.